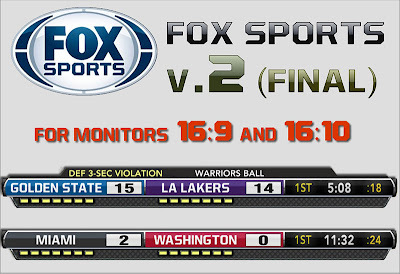 Play NBA 2K14 with FOX Sports scoreboard. 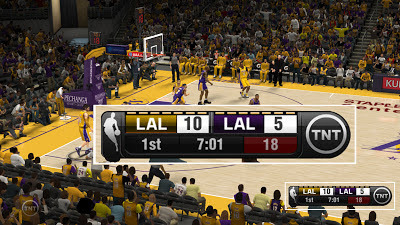 The overlay textures in this mod have been redesigned to copy the real NBA scoreboard that we see on TV, giving us a much more realistic gaming experience. It's recommended to change your camera view to broadcast to suit this scoreboard style. This mod replaces the original NBA 2K14 scoreboard with a new design, based on the real Turkish Airlines Euroleague Basketball scoreboard that you see on TV. Description: This mod will add the FIBA scoreboard that you see on live TV broadcast into NBA 2K14, in preparation for the release of FIBA 2K14 mod for PC. It is purely graphical and it doesn't alter other game files aside from the scoreboard. To install this mod, just extract the file into NBA 2K14 game folder and replace the original. Description: Here is a modification that will change the scoreboard in NBA 2K14. The design is based on TSN Sports NBA scoreboard that you see on TV. This mod does not affect team logos in any way, just the scoreboard design. 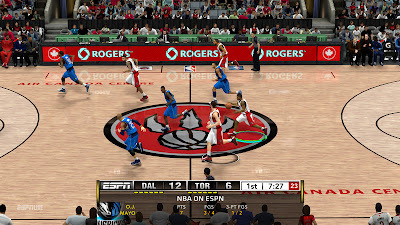 Description: This patch adds a new scoreboard in NBA 2K14, inspired from National Rugby League (NRL) FOX Sports TV scoreboard design. 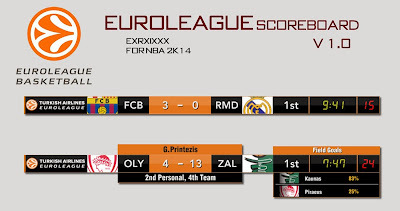 - Added the logos for the Euroleague Teams. - 5 New scoreboard colors: Black, Gray, Blue, Sky Blue, and Dark Blue Green. - With the new mod installer, you can now easily switch between 5 different scoreboard colors or even revert the original files easily. - In addition, you can also change between primary and secondary team color backgrounds. Description: Are you getting tired of the default 2K scoreboard? Good news! Exrxixxx is back with his first scoreboard mod for NBA 2K14. Check it out! - 24-second shot clock and quarter length time are completly functional. - Pop-up stats and panels are the same. - Doesn't ruin the team logos during transition screens. - Logos are slightly resized (NBA Teams and Euroleague). - Easy installation compared to last year's NBA 2K13. Just copy the files into NBA 2K14 folder and overwrite the files. - Patch includes the original logos & scoreboard for backup purposes. Description: This is an update to the new ESPN scoreboard with 3D logos by janmykelg. Don't forget to backup your files. 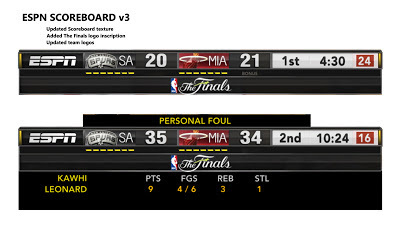 Description: This is the second and the final version of TNT 2013 scoreboard mod for NBA 2K13. Updated: Added logos for the other teams. Now you can go up against the legendary teams of the past. This includes all retro team logos, team USA and celebrity team. Description: This is an update to the latest ESPN scoreboard w/ 3D logos by janmykelg. 2. Install the team logos and scoreboard included in the v3 patch. Note: You may need to delete or replace the newscorebug.iff located under NBA 2K13 Roaming folder > Online Data > downloads. Note 2: If you're game is connected to the Internet (Online users), try blocking nba2k13.exe from accessing the internet using Windows Firewall to prevent the game from constantly updating and overriding the scoreboard mod. 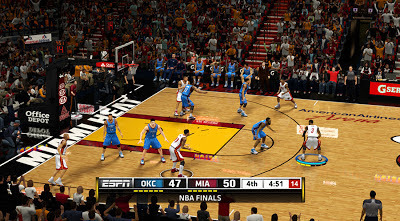 Description: This mod converts the NBA 2K13 team logos into 3D ESPN style. It also adds new ESPN presentations including transition screen, game arts, and scoreboard. Description: This mod for NBA 2K13 changes the default 2K game scoreboard into TNT 2013 scoreboard. 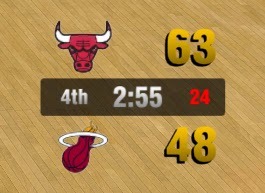 - Since the style of the TNT scoreboard is not centered, it's likely compatible with any game resolution. 2. Install the team logos and scoreboard included in the v2 patch. 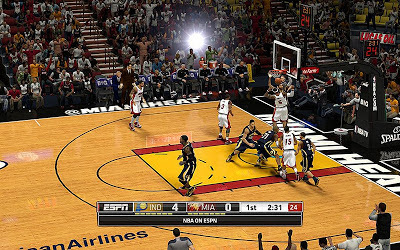 Description: This mod for NBA 2K13 adds a new ESPN scoreboard in the game with 3D NBA logos beside the team name abbreviation on the scoreboard. Description: This is a complete NBA on ESPN mod for NBA 2K13. It includes new ESPN scoreboard with enhanced textures, 3D ESPN logos, bootup screen and other game arts. Description: This is an update to the ESPN scoreboard created by Exrxixxx. 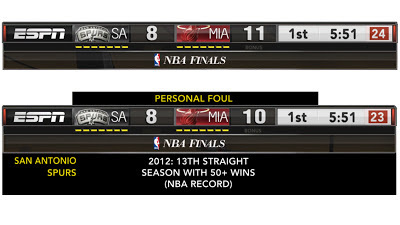 This version have team logos added on the stats board and latest ESPN scoreboard design. For best results, use the 3D logos from the ESPN presentation mod by Janmykelg. - Non-colored version which means it will not ruin the team logos during instant replay. - Includes "NBA on ESPN", "Eastern Conference Finals", "Western Conference Finals", "Finals", Plain version, and the original 2K13 scoreboard for backup purposes. Description: This is an update to the NBA TV scoreboard created by Exrxixxx. This new version adds team logos to the popup statistics board. For best results, use the ESPN 3D logos by Janmykelg. Description: This is an update to the ESPN scoreboard created by Exrxixxx, which basically adds team logos to the pop-up stats board. For best results, use the 3D logos from the ESPN presentation mod. 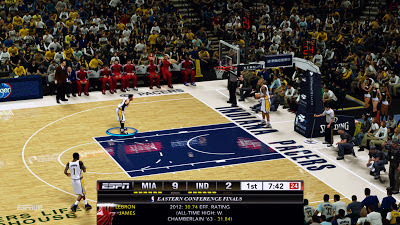 Description: This mod for NBA 2K13 PC adds a Time Warner Cable TV themed scoreboard. Recent changes: Updated to version 2. Added logos to player individual stats and single team stats pop-ups. 2. Wait for the cmd window to load then choose from #1 to #30. Type the number of your choice and press Enter. 3. WinRAR self-extracting archive will pop-up. Click the 'Browse' button and navigate over to where you installed NBA 2K13. 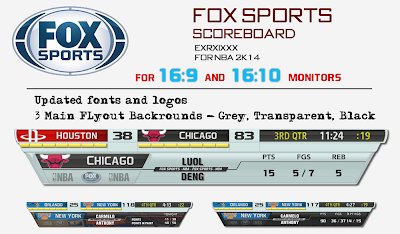 Description: A mod for NBA 2K13 PC that changes the default 2K scoreboard into Fox Sports TV themed scoreboard. 1. Choose between 16:9 or 16:10 version based on your game resolution. 3. Browse for the game directory located under Program Files. This depends where you've installed NBA 2K13. 4. Extract the files and wait until it's finished. 5. Go back to NBA 2K13 game directory and copy the file 'newscorebug.iff'. Description: This patch adds an ESPN scoreboard based on the real ESPN scoreboard that you can see on live television broadcasts. - Supports 16:9 and 16:10 (4:3) aspect ratio / game resolutions. 2. Unrar the file using Winrar or 7zip then run the .exe file. 3. Select a texture number from 1-12 and wait for the new window to pop up. 4. Extract the files into your NBA 2K13 game folder.